Today I feel like one of those senior citizen’s you see interviewed on ABC’s 20/20 talking about how they got scammed. My secret indulgence, if you will, is Rolex watches. I bought a Submariner for myself when I turned twenty-one. It is my day-to-day watch and has stood up to everything shy of an RPG attack. If you calculate the cost per day of ownership, I think a sundial would be more expensive. About three years ago I bought another stainless steel Rolex Submariner and had it blackened with the same process used on military equipment, DLC/PVD (See pic below). 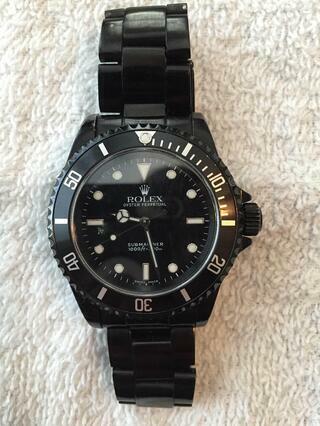 I don’t wear this watch enough and am in the market for a new Submariner, so I listed it on Craigslist. I was hoping to find a local buyer and avoid the risk or selling it to an unknown buyer out of state. Earlier this week I received a call from a guy in Texas wanting to buy my watch. He was super nice and very knowledgeable about Rolexes. I was very comfortable with our conversation and he seemed trustworthy. I expressed my concern about shipping the watch out of state and not knowing him. He told me he had sold a few Rolexes and used FedEx COD. It made sense, so I packed up the watch and took it down to FedEx and shipped it to him. That evening, I was having dinner with some of my buddies, telling them how I had sold my watch. They all looked at me like I was crazy for sending the watch COD. I was barraged with horror stories about how con artists can fake cashier’s checks…that FedEx doesn’t even check for watermarks. I Googled these scams, and to say the least there wasn’t a shortage of stories to make me paranoid. Now, I am a trusting person by nature and want to believe the best in everyone, but my friends made me take notice. So true. Thanks to the feedback from my friends, I decided to reroute the watch back to my home. The FedEx manager at the center my watch was getting delivered to called me to handle the reroute. He told me I was smart sending the watch back. His center gets five bad cashier’s checks a week. So thanks to the “wisdom of the group” I am out a hundred and twenty bucks in FedEx fees and not forty-five hundred dollars lost in a watch scam. Needless to say, Mr. Rolex buyer is not available for comment. After this little incident, it is easy to see how people can get taken advantage of. I will still believe most people want to do the right thing, but next time will exercise a little more caution. Any time you can tap into the wisdom of a group, you minimize your risk and find solutions to problems and challenges. I am part of a formal mastermind group for software company owners and a CEO Roundtable group; both of which have helped me out. We at Restaurant Catering Systems run a monthly group Catering Coaching Call and a private Facebook group called Restaurants That Cater. I have personally witnessed several members getting help with challenges and problems. Whether through us or other avenues, I urge you to join and participate in a group to help you better run your business. It’s nice to have a place to get reinforcement for your ideas or challenge you to make them better.